Kansas defeated Purdue 98-66 in the Sweet 16. North Carolina cutting down the nets. Xavier's run to the Elite Eight. Florida guard Chris Chiozza sending the Gators to the Elite Eight with a buzzer beater against Wisconsin. South Carolina reaching the Final Four for the first time. Practice already has begun for the 2017-18 basketball season, but that Sweet 16 of a season ago is still fresh on our minds. All of those teams, though, face one huge question this time around. Who can make it back? Regardless of which of these four statistical category you choose, one truth is immediately clear: Purdue returns a ton of what got it to the Sweet 16 last season. Purdue ranks first in three of the four categories we examined. The Boilermakers have big shoes to fill, quite literally, with the loss of 6-foot-8, 250-pound forward Caleb "Biggie" Swanigan, who led the team in both points and rebounds in 2016-17. 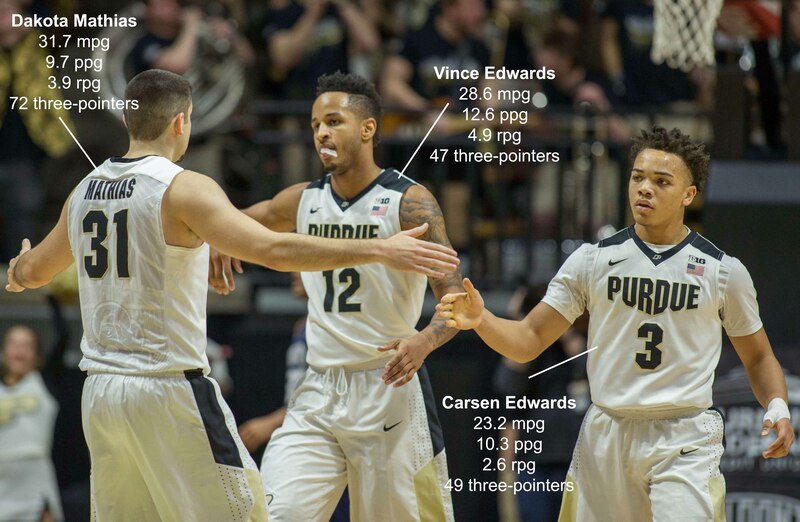 But the next six guys behind him on the Purdue scoring list, including senior forward Vince Edwards and senior center Isaac Haas, who both averaged 12.6 points per game, return from last year. As far as just playing time, 75.5 percent of the minutes played last season were from guys who are still on the roster this season. Purdue's roster features an impressive balance of guards, wings and frontcourt players who return from last year's Big Ten championship-winning team. If you're looking for another reason to buy in to Purdue, consider the extra practices and games under the team's belt with its participation in the World University Games in Taipei, Taiwan over the summer. The Boilermakers' veteran-laden squad is already off to a head start for the 2017-18 season. Both of last season's national championship game participants, North Carolina and Gonzaga, have to replace nearly two-thirds of their scoring, but that's not all that unusual for such successful teams. Florida's 2007 team, which returned its top seven scorers after winning the title in 2006 and then won another title, is the exception when it comes to returning production. 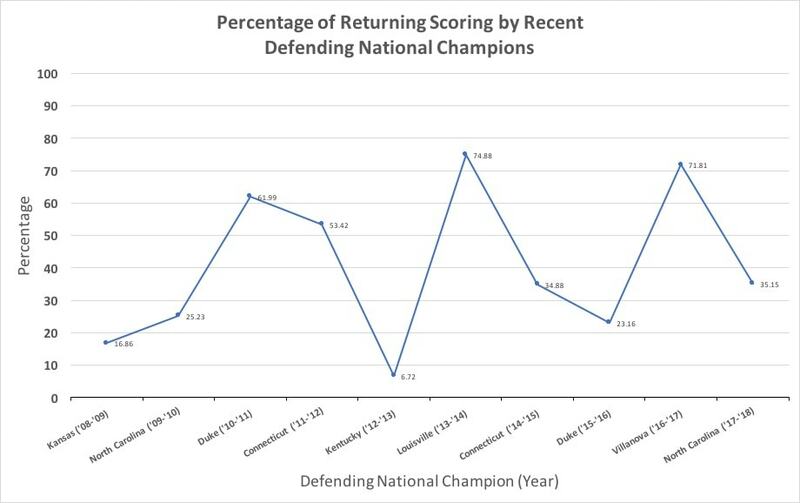 The last 10 reigning national champions (from Kansas after its 2008 title to North Carolina, most recently) have returned, on average, roughly 40 percent of their scoring after winning the title. Click on the graphic below to enlarge. Both the Tar Heels and Bulldogs bring back just one of their Top 5 scorers. Point guard Joel Berry II (14.7 points per game in 2016-17) is back for the Tar Heels, while forward Johnathan Williams (10.2 ppg) returns for Gonzaga. Fellow Final Four participants South Carolina and Oregon suffered even bigger personnel losses. The Gamecocks return 26.8 percent of their scoring, the Ducks just 13.4 percent. Purdue once against takes the lead in this category. Six Boilermakers who scored at least five points per game — Vince Edwards (12.6), Isaac Haas (12.6), Carsen Edwards (10.3), Dakota Mathias (9.7), P.J. Thompson (7.4) and Ryan Cline (5.4) — are back. Among other notables: One season after finishing second in the Big 12 and pushing Gonzaga to the brink before falling 61-58 in the regional final, West Virginia returns more than half of its scoring. The Mountaineers finished 23rd nationally in points per game at 81.5 per night, and the return of guard Jevon Carter (13.5 ppg) and forward Esa Ahmad (11.3 ppg) ensures the defensive-minded group should also be able to pack a punch on offense this season. Of last season's Sweet 16 teams, Butler brings back the highest percentage of its rebounding, but it still lost 42.2 percent of production on the boards. The Bulldogs return their top rebounders from a year ago —senior forwards Kelan Martin (5.8 rebounds per game) and Tyler Wideman (5.0 rpg). Arizona, which will be a favorite in the Pac-12 and one of the top teams in the country, returns 48 percent of its rebounding, though highly regarded freshman DeAndre Ayton, a 7-foot-1 forward, should be able to help alongside senior center Dusan Ristic (5.5 rpg). Ristic was second on the team in rebounds last season behind since-departed 7-footer Lauri Markkanen. We looked at the percentage of 3-pointers made last season by players who are returning this season. Of the four statistics we analyzed, none had a bigger variance than this one, which ranged from 6.5 percent (South Carolina) to 84.4 percent (Purdue). The Boilermankers' five leading 3-pointer shooters (in terms of volume of makes) return to West Lafayette. Senior guard Dakota Mathias made 72 threes last season while shooting at a 45.3 percent clip from behind the arc. P.J. Thompson, Vince Edwards and Ryan Cline all made at least 45 threes and shot better than 40 percent from 3-point range. 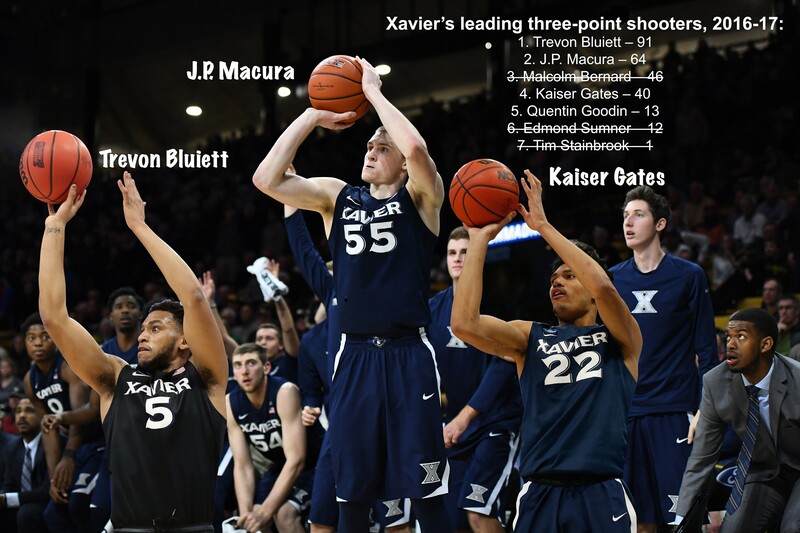 Only seven Xavier players made a 3-pointer last season and only four of them return, but the production of seniors Trevon Bluiett (91 threes last season) and J.P. Macura (64 threes) means that the Musketeers return nearly 80 percent of their made threes from the 2016-17 season. On the other end of the spectrum, South Carolina's returning players made just a combined 16 3-pointers last season. Kentucky's returning total isn't much higher (23).